Bineshii Commercial & Light Industrial Park – The Bineshii Commercial & Light Industrial Park is located on the north side of highway 17 between Young Forestry and the Anishinabek Nation Head Office near Yellek. To date, 3 phase hydro services have been installed and natural gas services were completed in 2017. 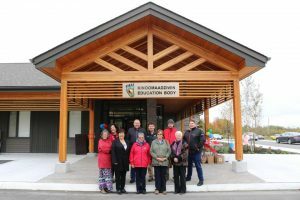 KEB Head Office – The Kinoomaadziwin Education Body (KEB) celebrated the grand opening of their head office in the Bineshii Business Park in the fall of 2018. 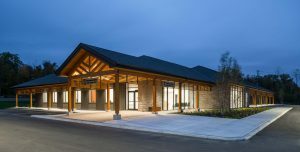 The KEB is the central education body that will support the Anishinabek First Nations in achieving their education priorities through the Anishinabek Education System (AES) and we are pleased that our proposal to house their office building on NFN was selected through an RFP process. Natural Gas Installations – We have now completed natural gas installations in the communities of Duchesnay, Yellek, Beaucage and Jocko Point. A feasibility study is planned to determine if it is possible to bring natural gas services to Garden Village. NFN Solar Projects – The 4 rooftop solar projects, with a total capacity of 166 kW, are under contract with the Independent Electricity Systems Operator (IESO) to generate electricity at a rate of $0.548/kWh, which translates to approximately $100,000 annually. These projects are located in Garden Village (Health Centre, Nipissing Ojibway Daycare, Seniors’ Lodge) and in Duchesnay (Nbisiing Secondary School). 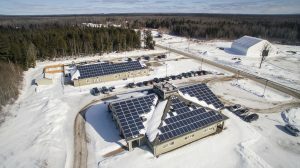 NFN – Solar Power Network (SPN) Partnership – Nipissing First Nation and Solar Power Network (SPN) have partnered to develop and operate a portfolio of roof mounted solar PV systems located throughout central and southern Ontario. The scope of this project has changed where the number of solar PV contracts was reduced from50 systems (14.2 MW) to 22 systems (6.7MW). The systems are fully constructed and are in commercial operation. The ownership structure has changed where Solar Power Network sold its share in the partnership to Grasshopper Solar, a large renewable energy development company in southern Ontario. NFN’s return on investment is 15%. A feasibility study is underway for a production scale greenhouse for Nipissing First Nation. The greenhouse will be self-sustaining, provide NFN with an additional revenue stream, provide employment and training opportunities, build capacity, and provide a healthy, sustainable food source for NFN members and surrounding areas. As part of the KEB office building located in the Bineshii Business Park, the building design features 5,000 square feet of commercial space that is available for lease to NFN businesses and entrepreneurs at special incubator rates, and that is open to non-member businesses at competitive rates. For more information about commercial leasing opportunities within the NFN Small Business Centre, please contact Michael Harney, Economic Development Manager at 705-753-2050 ext. 1264 or michaelh@nfn.ca.